Pakistan Revisits the Usefulness of ‘Armed Militias’—For What? Why does Pakistan’s prime minister believe that the country has no use for armed groups? Last week, Pakistani Prime Minister Imran Khan in a statement said that his country “had no use of armed militias anymore.” Khan also said that “we have decided, for the future of our country – forget the outside pressure – we will not allow armed militias to operate anymore.” Khan’s statement is important for two reasons that explain Pakistan’s current position regarding the alleged presence of insurgent groups on its soil and what the country plans to do next. It’s important to note that Khan’s statement implied that the country may have tolerated some groups in the past for different reasons. Moreover, Khan’s statement also meant the country could not afford to house any groups even if their military efficacy remained significant. The war and instability in Afghanistan that has continued for the last four decades forced Pakistan into adopting policies that involved leveraging the efficacy of insurgent groups for geopolitical reasons. The value of such groups extended beyond Afghanistan as Pakistan looked to reverse and frustrate India’s control in Jammu and Kashmir. Moreover, tactically, such groups may have also come handy for Islamabad when it comes to neutralizing the pressure of countries that Pakistan perceives as enemies, particularly India. Arguably, Afghanistan is one theater where most regional states have supported armed groups for political gains. At one point, in a quest to defeat the Soviet Union in Afghanistan, the United States, Pakistan, and a number of other states, raised armed militias. However, all of this changed during the early 1990s when the U.S. departed Afghanistan and countries like Pakistan were left to manage the crisis and the challenges it contained. The policy of endorsing the use of armed groups regionally has had its costs. For the past decade or so, Pakistan has been on the receiving end of terror. Militant groups such as the Tehreek-e-Taliban Pakistan (TTP) have created devastation in Pakistan due to the latter’s policy to target the organization. Reportedly, Pakistan’s economy has suffered around $123.1 billion in lost productivity and damage during the last 15 years. The financial crunch is not over yet, according to the International Monetary Fund’s latest warnings, growth of Pakistan’s GDP is expected to slow down to 2.9 percent for the next few years. It’s alarming that an indication in this regard was projected around 3.5 percent just a few months ago. 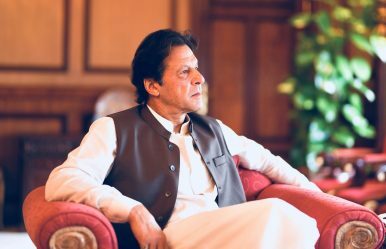 Khan’s statement comes at a time when Pakistan is under tremendous pressure to take action against groups which allegedly target India’s interests. While Pakistan cannot overtly take action against groups that have a deep support structure in Pakistani society, a policy of mainstreaming such groups was introduced by Islamabad a few years ago. While it’s unclear whether the policy will produce any dividends in the long run, some indications concerning the view of such groups suggest that the state has made its position clear: “The state doesn’t want its own peace overtures and reconciliation policies to be hijacked or dictated by anyone,” said a government official. A few days ago, a number of diplomats and journalists were taken to the madrassa in Balakot that was allegedly hit by India’s airstrikes a month ago. The interesting part of the visit was the delegation’s interaction with students and teachers at the madrassa, which has been called the training camp for the Jaish-e-Mohammed (JeM). For Pakistan, the interaction was aimed at sending two kinds of messages to the international community. One, that the seminary was neither a place of any militant group, nor was it hit by India’s air strikes. Two, the interaction also meant that Pakistan’s policy of mainstreaming religious seminaries and groups was being implemented across the country. However, apparently, the world remains unconvinced: The Paris-based Financial Action Task Force (FATF) recently told Pakistan that the group was not convinced that the country had done enough on the ground to rein in insurgent groups. Pakistan, on the other hand, alleges that FATF is following a political agenda due to Pakistan’s recent crisis with India and the United States’ criticism of Islamabad’s policy concerning Afghanistan. Arguably, the last 10 years of fighting with the Taliban has taught Pakistan one very important lesson: The state should be able to devise and follow its own policies rather than dictated by an armed group or a religious group that may be unhappy due to some policy change. Still, it remains to be seen if Khan has the support of major state institutions regarding his government’s policy to shut down any and all groups that have become a burden on the state. In any case, it’s vital for Pakistan’s stability that extremism has no space in the country. Malaysia and Pakistan push their bilateral ties forward.